Born from the love of beer and the passion to bring craft goodness to others, The Thirsty Growler opened its doors in May 2016. 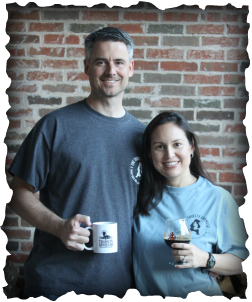 The Thirsty Growler was founded in 2015 by husband and wife duo, Mike and Andrea. Mike is a long-time home brewer and both are devoted advocates of the craft beer industry. Their goal is to help others discover the goodness of craft beverages. ​As a growler station and tap room, we hope you will come in and enjoy a pint or flight of some of our 50 beers, cider, or kombucha available on tap before deciding what you want to take home in your growler. Take a look at our FAQs page for some answers to our most popular questions.